The automotive world is rising at a great speed. In past few years we have seen the world bringing the range of electric cars but Audi came up with this new Audi h-tron Quattro Concept 2016. The concept will run over hydrogen. The Detroit Auto Show release also brings in some really great tech features that make it more adorable. 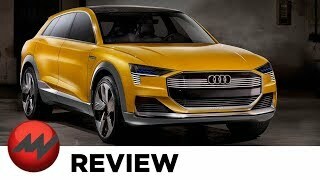 Let us have a look at the descriptive review of Audi h-tron Quattro Concept 2016 to know in detail about it. The first thing that you’ll notice about the interior of Audi h-tron Quattro Concept 2016 is the use of blue color. You can notice the accent over the door panels, the center console and all other vital parts. Another thing grabbing your attention could be the use of touch-sensitive buttons rather than the traditional knobs. There is also a large display mounted over the dashboard giving you range of information including the GPS. Behind the three spoke flat bottom steering wheel is a curved LED surface working as instrument cluster. However the task of infotainment system is accomplished through an OLED touch panel screen. Getting to the comfort zone the concept comes with well placed seats and offers sufficient legroom for a comfortable sitting. The center console marches its way till the rear and also works as an armrest for the rear passengers. Rounding up the interior details of Audi h-tron Quattro Concept 2016 I would say, it is tech oriented and has lots of comfort in it. The best thing about the exterior of Audi h-tron Quattro Concept 2016 is its aerodynamic body. Starting with the front fascia the model is equipped with OLED element integrated headlights using the Matrix laser technology. In between them is the massive octagonal grille featuring four rings adorning its center. Moving towards the rear end, along the sides you’ll notice the missing side view mirrors. Yes the concept comes with small cameras instead of mirrors. You can also notice body lines running from the headlight edges and marching their way till the rear. Leaving behind the muscular side view and getting to the rear end, things get pretty more focused. The flat-designed taillights with OLED design and the chrome inserts at the bottom add to the glory. 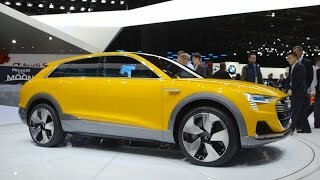 Thus rounding up the exterior details of Audi h-tron Quattro Concept 2016 I would say it is aggressive and muscular with pinch of elegance. As we mentioned earlier, powering the Audi h-tron Quattro Concept 2016 is a hydrogen fuel cell with a 100 kW battery. Talking about the time and the power, the former can be filled in less than five minutes while later gets the power through solar roof. Producing 550 nm torque the set up on its full roll covers 372.8 miles range. For the performance figures of Audi h-tron Quattro Concept 2016 we just have the sprint of 0-62 mph time and that can be knocked in less than seven seconds.